When New York subway passengers threw a party for a fellow-passenger. Jerich Marco Alcantara got an impromptu but memorable graduation party. 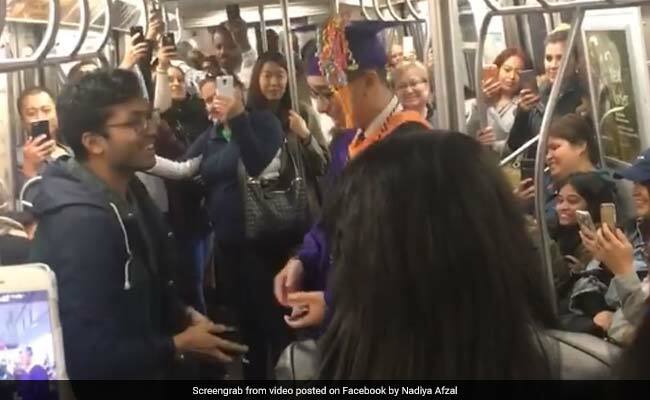 Passengers stuck in a train at New York did something memorable for a student who, because of the delay, was missing his graduation - they threw an impromptu party for him. ABC 7 reports that Jerich Marco Alcantara missed his graduation from Hunter College on Tuesday morning due to a train delay. 22-year-old Jerich then jokingly thanked all his fellow-passengers for attending his graduation ceremony. "Everyone seemed annoyed, and by that time, my commencement was already about an hour in," he said. "So I felt like lightening the mood and thanked everyone for 'coming to my graduation.' Told them it meant a lot to me, and they applauded it," he said to ABC 7. Jeirch was graduating from Hunter-Bellevue School of Nursing. The passengers did more than just applaud Jerich for being such a good sport. They threw him a graduation party inside the train itself! As Green Day's "Good Riddance (Time of Your Life)" played in the background, Jerich received a DIY diploma. The whole thing was captured by Nadiya Afzal and uploaded on Facebook, where it has been viewed over 1.5 million times. "This is the greatest thing I have ever seen," writes a commenter on Facebook. "Congratulations young man!!! So happy you were surrounded by the people who you will work with and who you will help in your journey! Best of luck," says another.